Please FULL VIEW and see all the details, it will have better quality. Here's my entry for the contest. It is no much to say, except that I have very much fun to made it. The most difficult was to find a suitable scan. At first the scans not please me very well. Then I found this sweet scan. I receive praise and criticisms gladly. Thats an awesome wall ^^ Great work! Oooh, a nice Halloween wallie. I like the background -- it's all warped and cool and stuff. Good work! The border bothers a bit - but the rest is very nice and clean - great job! This work is simply beautiful and very very neat Steffimon-Chan. :) I love the colors and brightness of your work. 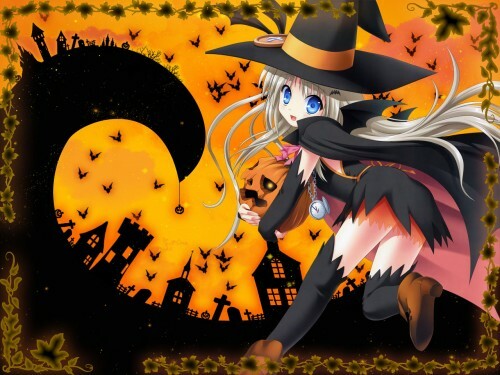 They're very cheerful and suites the Holloween Season very well. Also the background, it's very cute and pretty. Kawaii~ X-P X-P I love both the bg n the girl. It would be much nicer without the border though. Great job! :D ;) +fav. Arigatou! WOW, looks really cool^^lovely^^the girl is sooo KAWAII!